Preheat oven to 400 degrees F and line two baking sheets with parchment paper. Heat the olive oil in a wide, heavy-bottomed pan over medium-low heat and add the onions. Cook, stirring occasionally, until they begin to caramelize, about 20 minutes. Add the butter to the pan. Once melted, add the mushrooms and saute, stirring occasionally, until they are completely soft and all of the liquid evaporates, about 20 minutes. Add the garlic and the thyme and saute until fragrant, about 1 minute. Season with salt and pepper to taste. Add the wine, scraping the bottom of the pan to pull up all of the browned bits, and cook until all of the liquid has evaporated. Remove from heat. Unfold the thawed sheets of puff pastry and cut out circles from the dough, placing them evenly spaced on the baking sheets. Using a very sharp knife, make four small scores around the perimeter of the dough, about ¼ to ½-inch from the edge. 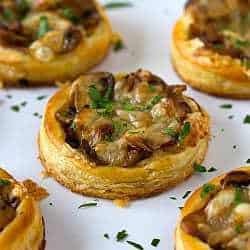 Top the rounds of puff pastry with a small spoonful of the onion and mushroom mixture, trying to keep the filling within the score marks. Top with the shredded Gruyere cheese. Brush the edges of the dough rounds with the egg wash.
Bake until the pastry is golden brown, about 15 to 25 minutes. Garnish with fresh chopped parsley.